Vinification: In 80-hectoliter stain-less steel tanks, truncated-cone shaped, at controlled temperature, which never exceeds 32C. First fermentation lasted 16 days. Vinification: In 80-hectoliter stainless steel tanks, truncated-cone shaped, at controlled temperature, which never exceeds 32C. First fermentation lasted 15 days. Deep and intense ruby red. A clean nose with hints of blackberry, vanilla and liquorice. The taste is rounded and concentrated, with great vitality, yet elegant and harmonious, thanks to the particularly sweet tannins. Very long finish and extremely well balanced. Wonderful aging potential. Firm, generous and well balanced, with sour black cherry flavours and very good tannins. Vinification: In 80-hectoliter stainless steel tanks, truncated-cone shaped, at controlled temperature, which never exceeds 32C. First fermentation lasted 15 days. Vinification: In 80-hectoliter truncated-cone-shaped stainless steel tanks, at controlled temperature, which never exceeds 32C. First fermentation lasted 13 days. 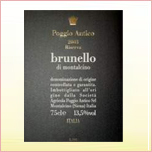 This is an ‘early Brunello, the grape yield used is identical to those of the classic Brunello. Madre is a brand new 'Supertuscan' red wine with first vintage 2001. 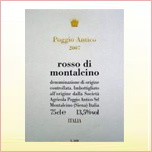 Its bouquet is concentrated, with black ripe fruit, cocoa, coffe and spices. On the palate it is dense, structured, warm and youthful. Madre can already be enjoyed, but may also be aged for a long time, further improving its characteristics.